♥ Yves Rocher Lipstick in 'Rouge' - I received this lipstick in the latest Glossybox and have been hooked ever since. It's great to wear for an evening out and adds a touch of Hollywood glamour to your look. What I love the most about this is that it is probably one of the most hydrating lipsticks I have ever come across, like ever. 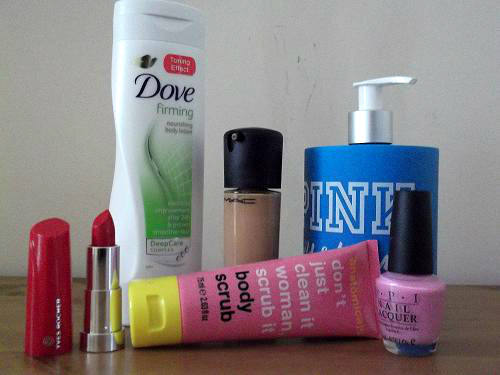 ♥ Dove Firming Body Lotion - Okay, I admit it. My diet which I done oh so well on has gone kaput, but Monday is always diet day! Although I'm sceptical as to whether this genuinely tones the skin in 'problem areas', it is so moisturising and makes my skin feel amazing afterwards. ♥ MAC Pro Longwear Foundation NC30 - I decided to part ways with my trusty MAC Studio Fix as it just wasn't working with my skin type any longer. And I'm so glad I did! This stays put all day and isn't an oily formula which keeps me shine free all day. I'll be doing a more detailed review on this sometime soon, so check back! ♥ Victoria's Secret PINK Wild & Breezy Body Lotion - Who doesn't love a bit of Victoria's Secret?! Ever since the two stores opened in London I've been hooked. I picked up this body lotion wit the matching body mist and always get a compliment how fresh and fruity I smell. Winning! ♥ OPI Nail Lacquer in Bubblegum - I love a pale pink nail polish! After my beloved Pale Pink by Models Own ran out I decided to treat myself to an OPI polish. They real are the Rolls Royce of the nail polish world! So pigmented and the brush is a bigger size which makes application a dream. ♥ Anatomical Pink Grapefruit Body Scrub - Again, I received this in last months Glossybox and I have been hooked. I recently swapped sunbeds for St Moritz and this preps my skin so well. I may even say better than Soap and Glory's 'Flake Away', which if you know the product, is so hard to beat. What have been your favourite products from October? Love the colour of the lippy! Reds are my ultimate go to!